If your staircase has curves what’s the best stairlift solution? This situation is all too common in both modern and also older home construction. So what are your stairlift options for multiple flights of stairs? The ultimate stair climbing solution; is a true “custom curving stair lift” such as the high quality Stannah 260 model. 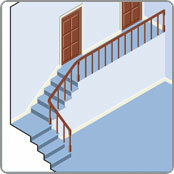 A curving lift will carry a single user safely and reliably up and down the stairs in one continuous run. This type of stairlift has a rail or track that securely attaches to the stair treads (not the wall as often thought) and perfectly follows every curve or turn of your staircase from top to bottom. You may choose from many rail configurations as well as multiple seat types to suit your comfort and décor. Multiple options for seat design to suit your specific needs and décor. 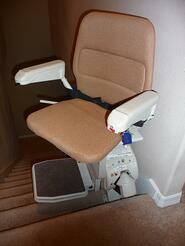 As the stairlift is a custom design to perfectly match your staircase there is a short lead time. 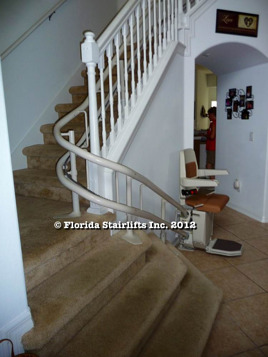 Two or more straight stairlifts; the installation of two straight Florida Stairlifts may also be a viable alternative to the custom curving stairway chairlift. 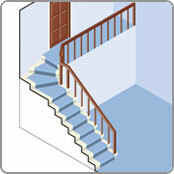 Staircases with multiple flights separated by a “flat” landing can often accommodate two straight Florida Stairlifts. All users will of course be required to move from one stairlift to the next to complete a journey from top to bottom of the stairs. Hand rails and the addition of grab bars in strategic places may certainly help users transfer from one stairlift to the other. In situations where the stairs have “pie” shaped steps separating the main flights of stairs careful consideration must be taken to ensure that the user will be able to safely negotiate getting on and off the seat over such steps. It is also possible in some instances to modify and eliminate the “pie” shape step completely before the stairlift is installed. 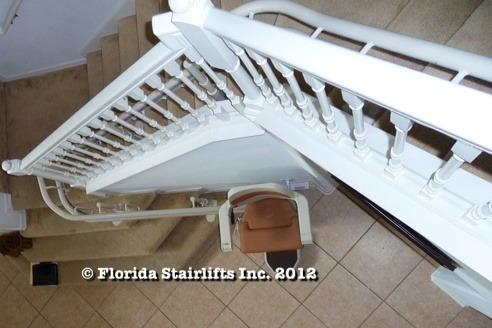 Take advantage of your “free” Florida Stairlifts Inc. stairlift expert survey to get advice on staircase modifications. 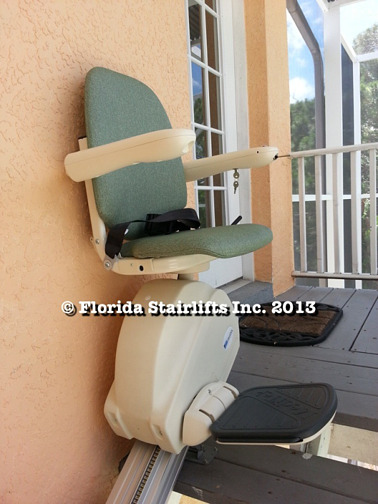 Florida Stairlifts straight stairlift models have seat heights that can be adjusted to make transfer from one stairlift to the other easier. Multiple options available for seat design to suit your specific needs and décor. Users must be able to transfer from one stairlift to the other during the journey. The deciding factor should be the physical capabilities and limitations of the stairlift users now and into the foreseeable future. 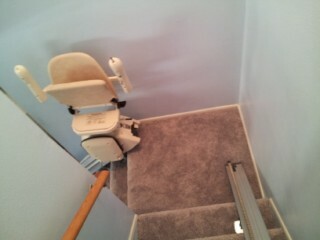 Two stairlifts should not be installed if the user may not be able to safely transfer from one stairlift to the other. The ideal solution is to travel up and down the stairs in one continuous run with a custom curving stairlift. If your budget is tight then two straights may work for you but choose a stairlift that has a good resale value just in case you need to change to a curving rail stair lift. 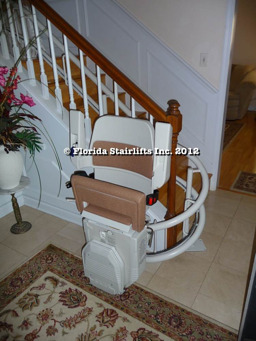 Seek advice from the "Stairlift Experts" call Florida Stairlifts Inc. today.